It was a goal that further fed the footballing schism North London, bringing with it agony for the red half and unbridled joy for the white – the latter merrily celebrating it in song for years to come. Indeed, it was 21 years ago this very day that Arsenal’s European trophy dreams were smashed by Mohammed ‘Nayim’ Ali Amar… from the halfway line. The Gunners were up against Real Zaragoza in Paris at the Parc des Princes, and truth be told it had been a pretty dull game for the most part. Juan Esnaider’s put the Spanish side ahead in the 68th minute before John Hartson equalised in the 77th to ensured the drudge would go the full distance. Then, as penalties seemed an inevitability, Nayim’s remarkable super-hoofer in the final few seconds of extra time sealed the deal. It wasn’t quite from the half-way line, but why let specifics get in the way of a good haranguing? The goal was not a fluke. Anyone who knows me knows I intended it. I had played against Arsenal for five years with Tottenham and remembered they always played with a high defensive line, with the goalkeeper acting like a sweeper. So before the game I told my team-mates and our coach that we should try and shoot from the halfway line. The goal also gave rise to a pithy gag about Nayim being the world’s most virile man due to how far he could lob Seaman, but you won’t catch Pies indulging in such puerile wordplay. 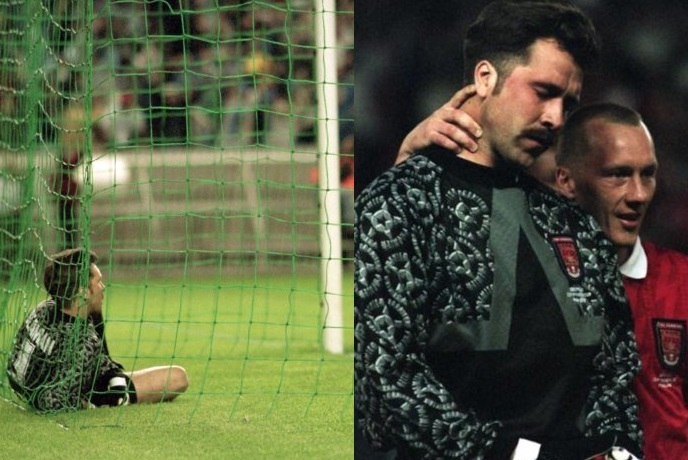 Seaman was just a poor goalie, period….. He got similar, embarrassing one, from Ronaldinho, also in a very important game, almost same distance, about 5 years later.